Image: Yarl's Wood protest, Darren Johnson/Flickr. Last Friday, I visited people detained at Yarl’s Wood, where a protest against immigration detention, including a hunger strike, has been going on for a month. The seven women and one man were clear from the outset that uncertainty over how long they would be held “is a killer”. Yarl’s Wood is supposed to be a 'removal centre', but instead many people there have ongoing cases, including asylum cases, and would be able to fight them better from outside, with access to relevant documents, witnesses and other evidence. In fact, the figures show that the majority of people detained will eventually be released back into the community; the trauma and cost of detention for nothing. The people I spoke to do not understand the reason for their detention. They complied with the signing process which requires them to report regularly at Home Office or police buildings. They were in touch with the Home Office – there was no risk of absconding. One detainee I spoke to has been in the UK for 24 years. Detention has separated her from her family, her friends and her support network. The detainees I spoke to have lost hope that due process is being followed. I have heard about people being removed from the country when there are ongoing judicial reviews. I have heard that the monthly reporting processes and reviews are hopeless. I have heard of caseworkers just cutting and pasting from old decisions to detain. I even heard of a person being served with a notice that clearly referred to a different detainee. Many have lost faith in the bail process, which is difficult to access. Many believe that immigration judges just follow Home Office advice that the person is a “flight risk”. In Yarl’s Wood, I was told that “everyone is crying”. The detainees feel the health care service is overwhelmed – by the number and nature of the demands on in. Mental ill health is massive. The people I visited want to see the Home Office accountable – a 1 to 1 approach to decision making. They feel no one individual is dealing with their cases – they are passed around instead. They are calling for a strong and independent complaints body. I believe - and I have said in parliament - that the large-scale, routine detention of thousands of human beings in private prisons for an indeterminate period at the discretion of immigration officers is a stain on our democracy and an affront to the rule of law. There is no need for the UK to detain more than other European countries. There is no reason why the UK – uniquely in the EU - cannot deal with a time limit on immigration detention. There is no reason for the Government to continue to detain vulnerable people, including victims of torture, to the serious detriment of their health and wellbeing. 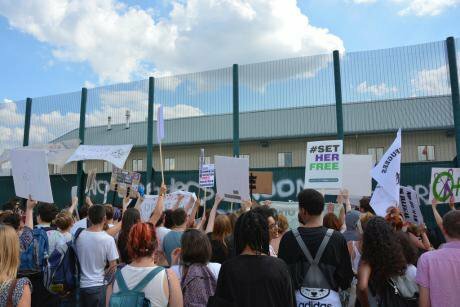 It is time for radical reform of the UK immigration detention regime and it is time for a limit on detention.